It's a fairly recognized fact that zombies hate water. So when the dead start walking, you best be heading off-shore. 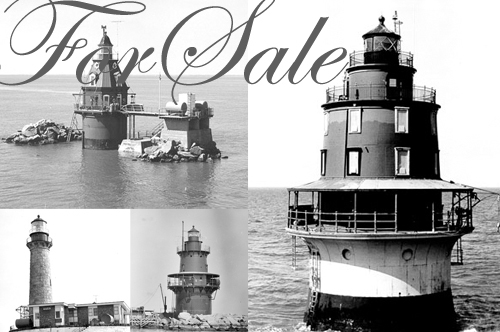 Fortunately, Uncle Sam is ready to oblige your nautical needs with, not one, but four deep water light stations up for auction. Accessible only by boat, pick one of these up and your survival odds will be well-positioned to take advantage of the severe lack of zombie seafaring tradition. Designed to hold out against the harshest ocean conditions and constructed around the turn of the century, give or take, these isolated beacons are built to last, too. Heavy concrete, cast iron caissons, reinforced brick and just the right amount of victorian flair are par for the course. Toss in a little paint, a little love and a desalinization plant, and you're ready to go. Check 'em out! Miah Maull Light Station - "The Lonely One"
The light station was constructed in 1913 and is a cast iron, 45-foot conical red tower with a black lantern, topped with a cornice. The foundation is a concrete and cast iron caisson, 40 feet in diameter. The three-story interior is lined with brick. Ship John Shoal Light - "The Baroque One"
(The Ship John Shoal Light) was built in 1877 to mark a hazardous underwater terrain feature known as Ship John Shoal. The lighthouse is a fifty foot high Second Empire Style red octagonal tower with its cylindrical concrete filled caisson foundation. Included with the lighthouse is a concrete pier and a boat dock with riprap north of the lighthouse and a separate riprap deposit south of the lighthouse. The Property has a watch room and an octagonal lantern surrounded by an open gallery. It is accessible by boat only. Little Gull Island Light Station - "The Private Island"
Little Gull Island, located approximately seven (7) nautical miles from Orient Point, New York in Long Island Sound, contains approximately one (1) acre of land and is improved by the Little Gull Island Light Station. The Light Station was constructed in 1869 and contains approximately 450 square feet of space. 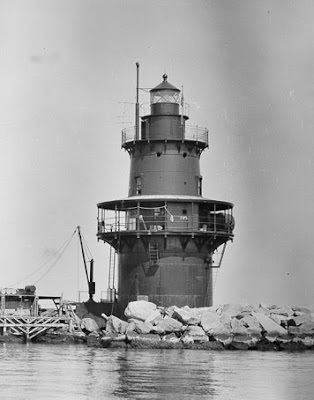 Orient Point Lighthouse - "The Rocky Citadel"
Built in 1899... ...The lighthouse consists of a brick lined cast iron plated tower section, a base section that is a concrete filled cast iron caisson, and a south facing vessel breasting structure consisting of a steel frame with timber/rubber fender panels. Orient Point Lighthouse stands approximately 45 feet tall and is comprised of six levels, including two watch decks and three stories of living quarters. If you're looking to bid, make sure you read the terms of sale.